Nice template, but the font color in all form fields is white, so you do not see the information you enter, see login module. 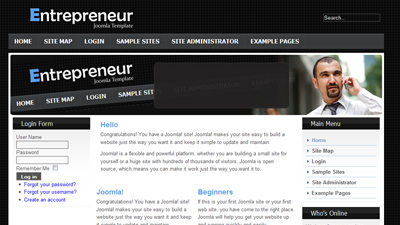 As soon as I installed this theme on joomla1.6 the top menu is not visible. Is it in a wrong position? You have to set the module position to “menu”. I’ve got a problem with this template. When I clic on a menu categori and go to the content the template is completly down. No more white background, menu on the left goes after the content. Can you please help me ?